Across the parish all three churches are now fully committed to using only Fairtrade coffee, tea and sugar and raising the profile of Fairtrade issues as much as we can. We are now almost a registered Fairtrade Parish, halleluia! 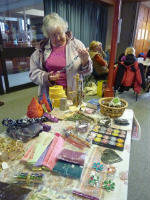 Traidlinks shop in Wirksworth continues to supply us with ‘sale or return’ goods at least twice a year so we can have stalls in church or at local community events. The Real Advent Calendar was popular this year, not only for the Fairtrade chocolate it contained but also for its emphasis on the real Christmas story! As we as a parish explore what it means to be ‘Eco church’ we will be taking ethical issues much more seriously, Fairtrade is an integral part of this. Could the next step be to have someone to speak about Fairtrade at a group you attend or run? We have come a long way but we can always do more!